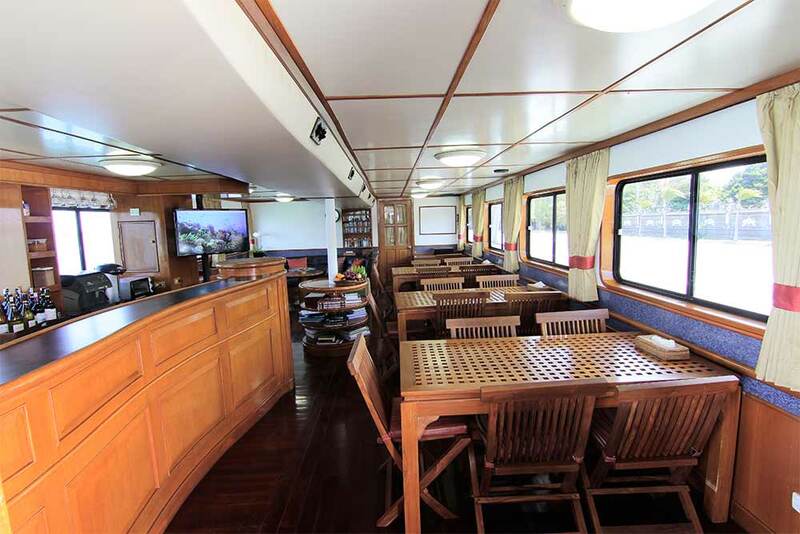 While most Indonesian diving liveaboard boats are locally-designed (Phinisi) with a wooden hull, MV Mermaid 1 is a specially-designed diving ship, purpose-built for scuba diving in all sea conditions faced in Indonesia. 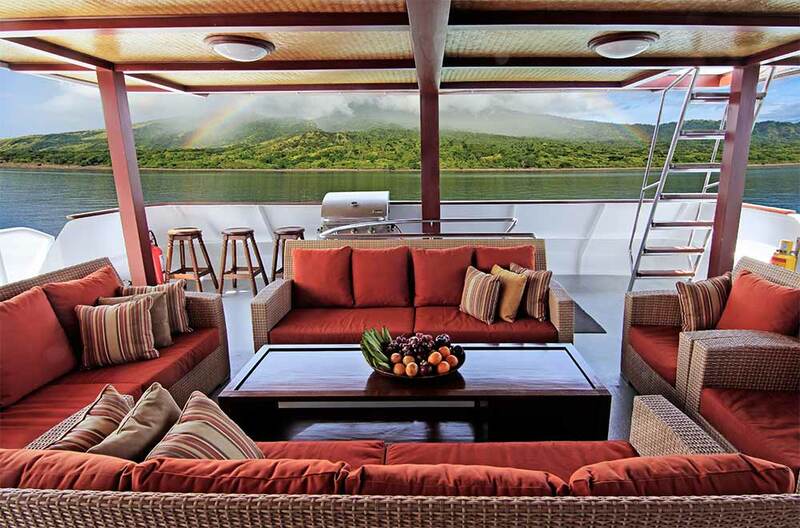 The boat has three decks, and plenty of space for guests to find privacy or socialize in groups. 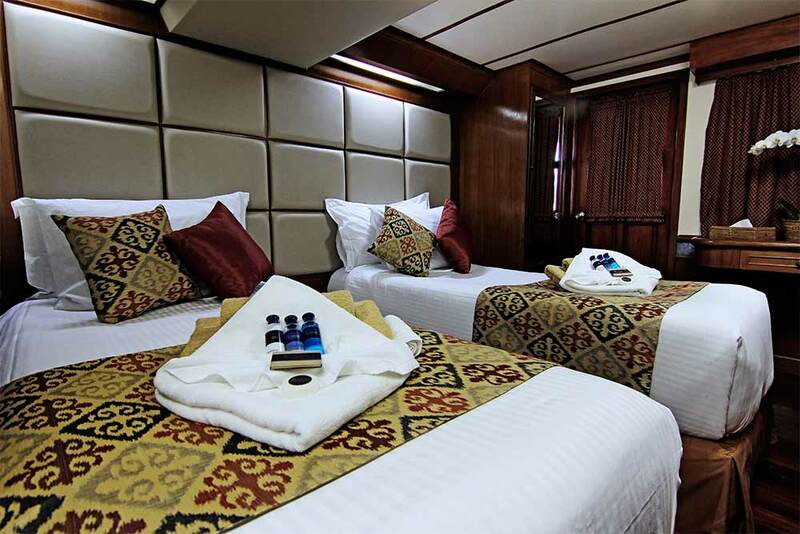 All of its 8 cabins are air conditioned, have en suite bathrooms, refrigerators and flat-screen televisions with AV entertainment systems. 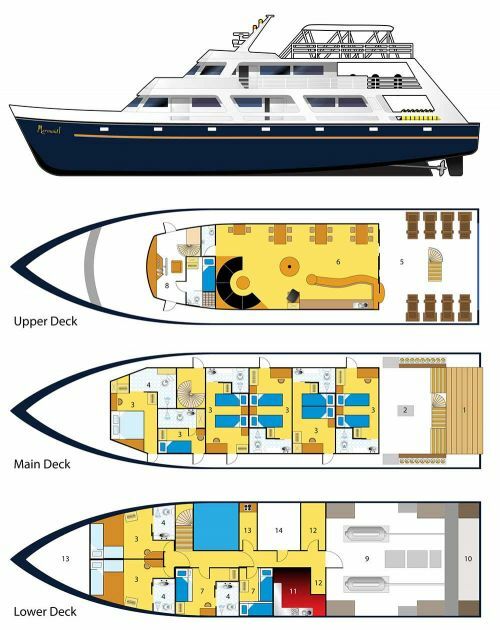 The dive deck and equipment facilities and storage areas are all large and well designed for comfortable diving cruises of up to two weeks in length. At 28 metres in length & 7 metres wide, MV Mermaid 1 is an ideal size to cruise around some of the best dive sites in the world. Everything is designed and fitted with convenience and safety in mind. The boat can cruise at nearly 10 knots, and effortlessly reach far-away diving destinations during the day or night. Such is the comfort on board that it can be difficult for guests to want to leave the boat and jump in the water. However, the choice of Mermaid 1’s diving locations at any time of year ensure that it is well worth the plunge. Komodo National Marine Park and Raja Ampat offer some of the best diving in the world, with Manta Rays or Whale Sharks sighted on almost every trip. 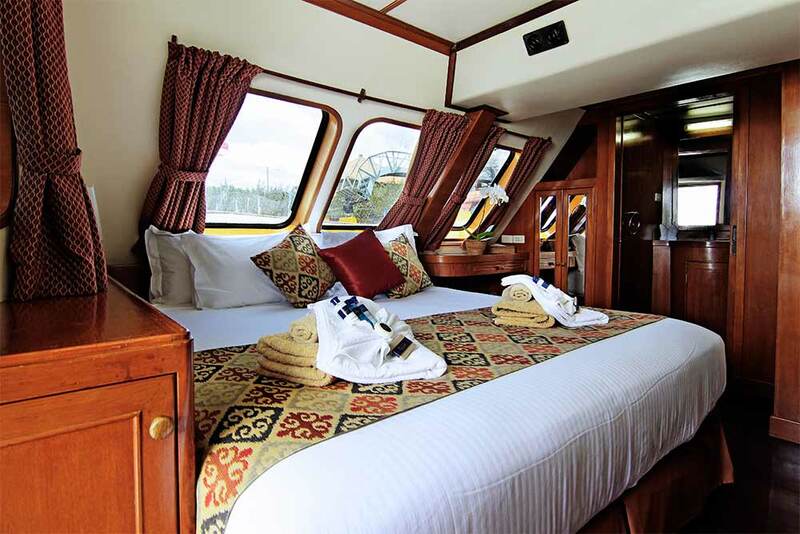 After each dive, guests can return to the luxurious surroundings of the boat, and enjoy a hot shower and delicious meals in the air-conditioned saloon. At any time during the cruise, there are plenty of opportunities to sunbathe or enjoy the sea breeze in the shade, alone or in groups. The designers appreciate that guests have a wide range of tastes when it comes to sleeping arrangements. 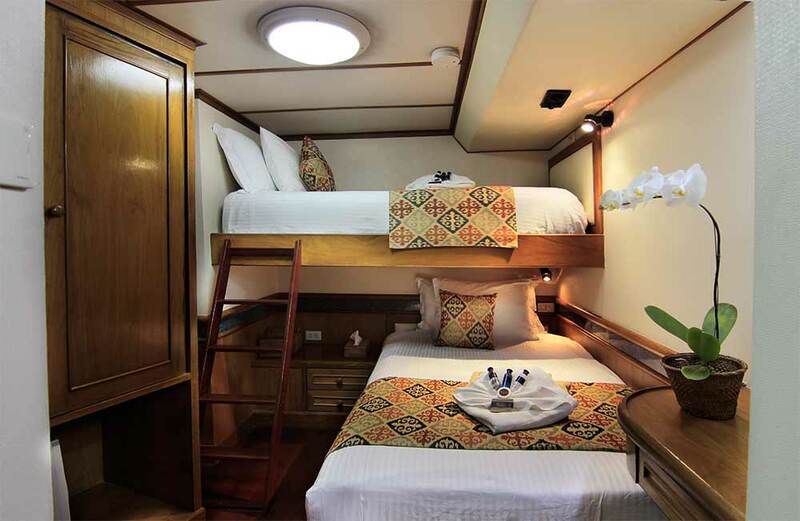 Therefore, on MV Mermaid 1 there are single, twin, & double-bed cabins to choose from. All are beautifully decorated and well-furnished, including private refrigerators. In addition, the master, deluxe & single cabins have large windows that offer wonderful sea views. Naturally, daily housekeeping services ensure that guests always feel comfortable when inside. Mealtimes are very special on MV Mermaid 1. Although there are always fruits, snacks & drinks available, the main meals each day are a feast of Thai, Indonesian & western cuisine. The chefs and kitchen staff are happy to cater for special requirements and tastes. Don’t expect to return from the cruise any slimmer than when you join! 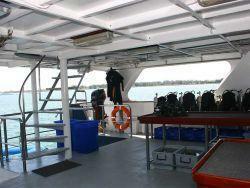 A vitally-important part of any liveaboard diving boat is its dive deck & platform. 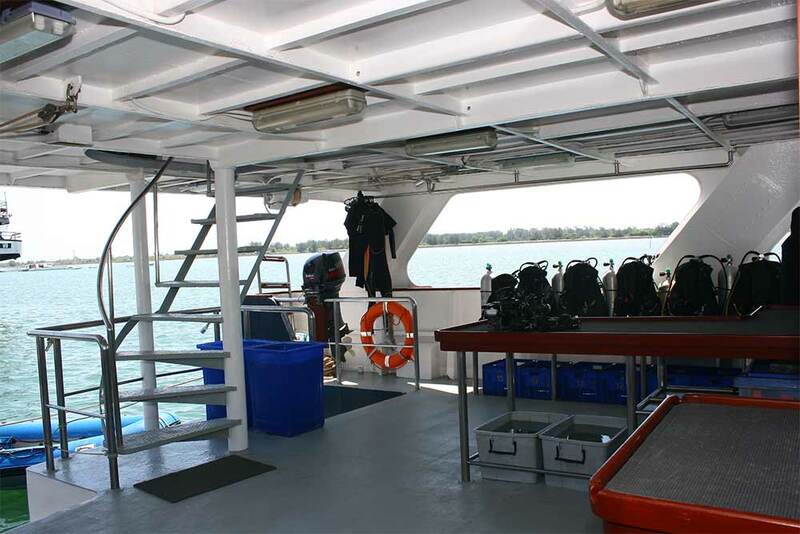 On Mermaid 1, there is more than enough space for guests and dive staff to prepare for each dive, walk around, enter & exit the water, and rinse & store photographic equipment. Mermaid 1 has several itineraries, so please check and choose carefully from the list below. Komodo & Raja Ampat trips normally depart from and return to the same place, but at the beginning and end of the Komodo high season Komodo may start or finish at Maumere. 'Crossing trips' (for example Raja - Ambon) go in one direction or the other, and usually visit the same locations but in the reverse order. Please note that the length of trip may be shown elsewhere on the internet as longer than we show. For example 10D/9N, when we show 9D9N. This is because there is often no diving on departure day, and never on the final day because guests disembark after breakfast. The use of a dive computer is mandatory on Mermaid 1. Unguided buddy diving is permitted at certain dive sites, and always at the disretion of the cruise leader. 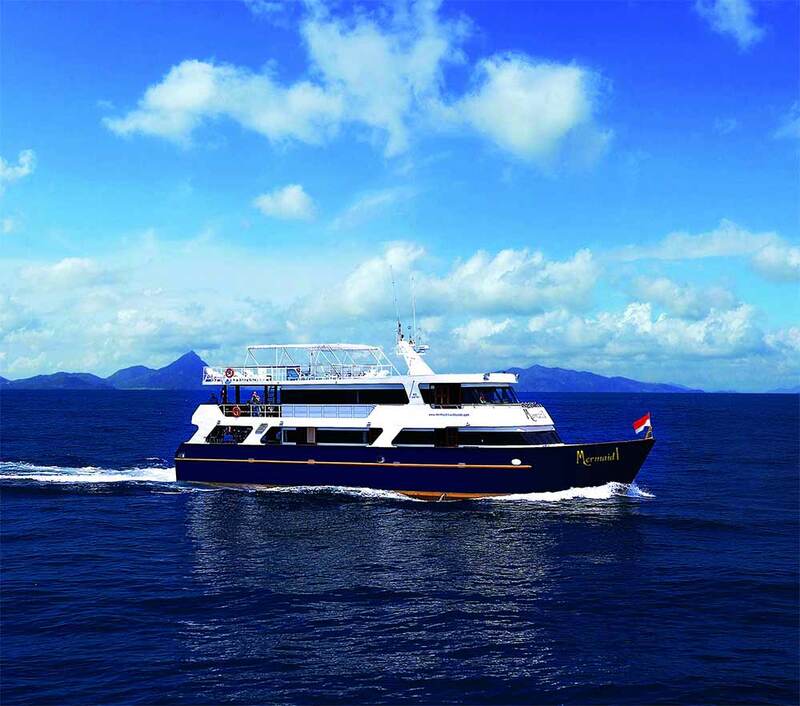 Although nearly all guests who join MV Mermaid 1’s trip are certified divers who just want to enjoy the cruise, there are often those who want to take part in a PADI or SSI diving course while on board. This is easily done with advance warning, but not necessarily confirmation. Advanced Open Water and Enriched Air (Nitrox) courses are the most popular. Please contact us to check about a Mermaid 1 diving course in your preferred language. Boarding time at Benoa Passenger Pier at Benoa Harbour Bali is between 13:00-15:00 hours for our 16:00 hour departure. Final cruise departure time is subject to guest arrival times. Please liaise with Mermaid Liveaboards if your flight times cannot fit this schedule. Transfers from/to the airport or hotels in the south are free of charge. From destinations in central and northern Bali, there is a small charge. Please refer to the price list. Guests arriving before 12 noon on departure day will be transferred to Mermaid Liveaboards guest lounge at All 4 Diving at Sanur Beach where they can leave luggage in safety until boarding transfer at 2pm. 12:30 Nusa Dua, Ullawatu, Canggu, Kerobokan, 13:00 Jimbaran, Seminyak. 13:30 Kuta Beach, Legian, 14:00 Sanur Beach; 11:00 Tulamben; 12:00 Candi Desa, Padangbai, Ubud. For other locations in Bali, please contact us. Guests making their own way to the port must let us know at least 2 weeks prior to the cruise. Boarding time for “own transport” guests is 1-2pm. Transfer Times: We will meet all flights and bring you straight to the vessel on cruise departure day or from your hotel by approx. 12 noon. Guests are recommended to arrive one day prior, to be sure you can make cruise connections. We will meet you at the airport or your hotel in Manado City area by 12pm to transfer to the vessel on cruise departure date. Or if you are staying in Lembeh, we will coordinate the best transfer method with your resort and advise. Price is on application for transfers from other locations. Transfer times: We will coordinate your arrival and collect you from the airport or your hotel and bring you direct to the vessel. 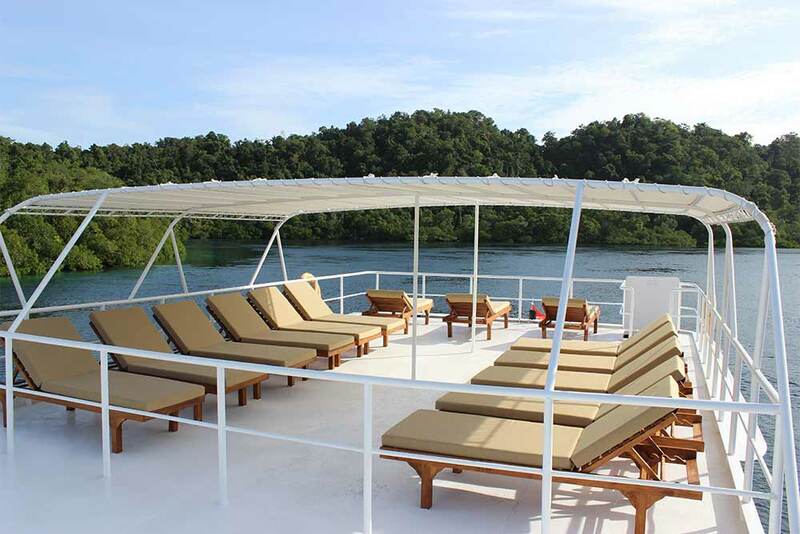 There are several reasonable hotels in Sorong plus there are some wonderful island retreats around and about that you may wish to stay at before or after your cruise. Domestic Flights: The majority of local flights need to be booked in Indonesia, and international credit cards are difficult to use. Some airlines accept internet bookings such as Silk Air and Lion Air. Equipment on board: Rental is charged on a “per diving day” basis. Full rental equipment is available. Dive computers are mandatory for every diver. Please advise your rental equipment needs including sizes when you book. Mermaid 1 carries mostly 12-litre tanks, plus some 15-litre tanks are available at no extra charge. Tank valves are INT, and some DIN adapters are available on board. If Mermaid Liveaboard equipment is lost/damaged, full replacement cost will be charged at the discretion of the Cruise Director. Published equipment prices are available on board.